The highly anticipated new story arc of Ed Brubaker and Sean Phillips’ KILL OR BE KILLED is on fire with fans eager to pick up where the Volume Three trade paperback’s jaw-dropping cliffhanger left off. KILL OR BE KILLED #15 is being rushed back to print in order to keep up with the overwhelming demand. PORTLAND, OR, 1/25/2018 — The highly anticipated new story arc of Ed Brubaker and Sean Phillips’ KILL OR BE KILLED is on fire with fans eager to pick up where the Volume Three trade paperback’s jaw-dropping cliffhanger left off. KILL OR BE KILLED #15 is being rushed back to print in order to keep up with the overwhelming demand. 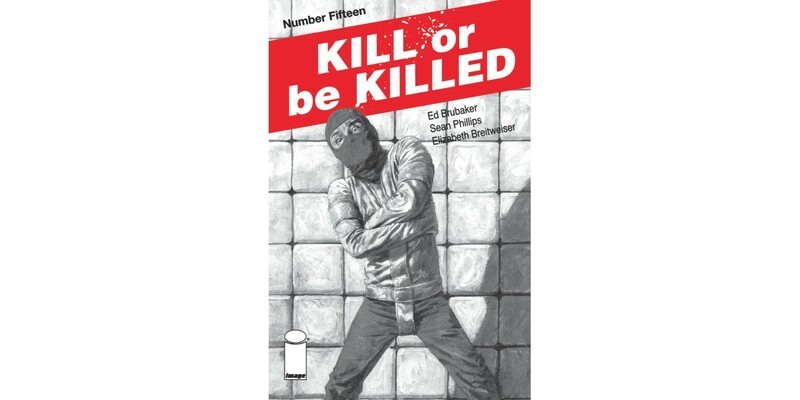 A departure from Brubaker and Phillips’ noir leanings, fan and retailer support has positioned KILL OR BE KILLED as one of the hottest series on shelves. The addictive ongoing series hooks readers with monster-of-the-week style storytelling and gut-punch plot twists. And the popularity for the series landed KILL OR BE KILLED, VOL. 1 on Diamond Distributors' Top 25 Bestselling Titles of 2017 list. The series is currently in development for the big screen with John Wick Director Chad Stahelski and producer Basil Iwanyk on board the project. KILL OR BE KILLED follows a young man who is forced to kill bad people and how he struggles to keep his secret as it slowly ruins his life and the lives of his friends and loved ones. In this cannot-miss issue, Dylan is forced to confront the reality of his violent actions and his sanity...and nothing will ever be the same again. Every issue of KILL OR BE KILLED contains extra content and articles only available in the single issues. KILL OR BE KILLED #15 will remain available for purchase across all digital platforms, including the Image Comics website (imagecomics.com), the official Image Comics iOS app, Comixology’s website (comixology.com), iOS, Android, and Google Play. KILL OR BE KILLED #15, 2nd printing (Diamond Code DEC178235) will be available on Wednesday, February 21st. The final order cutoff deadline for comics retailers is Monday, January 29th. KILL OR BE KILLED #16 will be available on Wednesday, February 14th.